This is part of a series of mini sculptures, or "3D paintings", created in polymer clay with mixed media. The clay is molded with the beads and then baked. After curing, the sculpture is painted with acrylics and gold leaf and finally attached to the painted wooden surface. 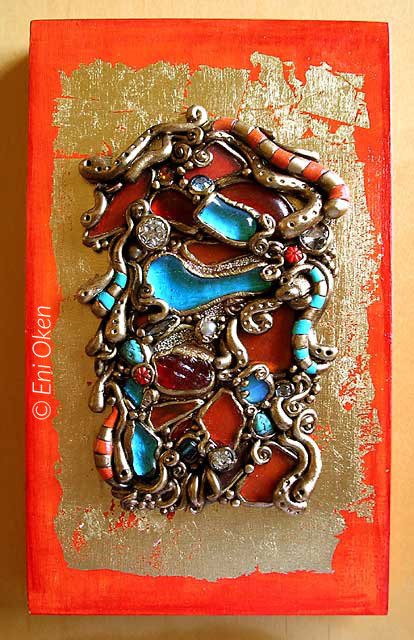 Polymer clay, gold leaf and other mixed media (acrylic paint, glass, rhinestones and pearls) over painted wooden surface, 4.75x8" (outer frame), 3.25x5.25" (sculpture).